Like most of Greenland’s perimeter, its northern coast is lined with fjords that wind between rocky islands and peninsulas and connect inland areas to adjacent seas. That’s not the only similarity to southern Greenland. 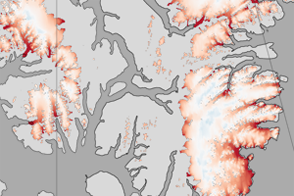 Glaciers that “flow” into these northern fjords are also retreating, losing mass, and speeding up. 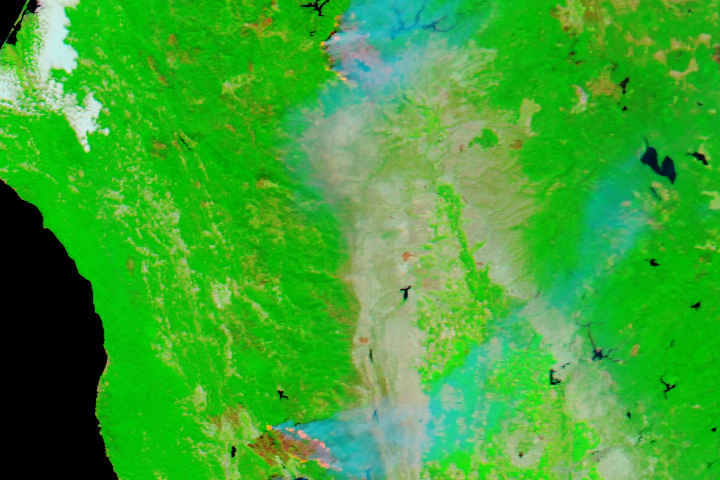 On July 27, 2018, the Moderate Resolution Imaging Spectroradiometer (MODIS) on NASA’s Aqua satellite acquired this natural-color image of northern Greenland. 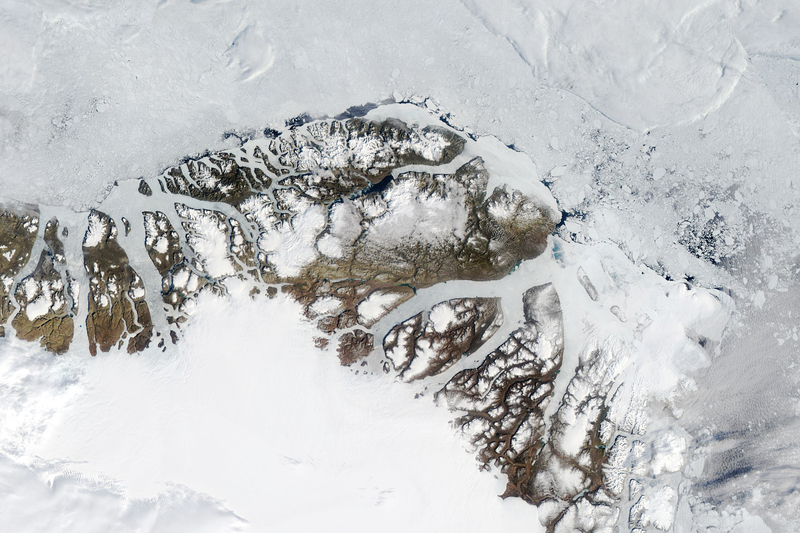 On the leftmost side, Steensby Glacier flows into Sankt George Fjord, between Nyeboe Land and Warming Land. Continuing toward the east, we see more ice-choked fjords and rocky outcrops dotted with dome-shaped areas of glacier ice. One such ice cap is Flade Isblink, which covers almost the entirety of Kronprins Christian Land. 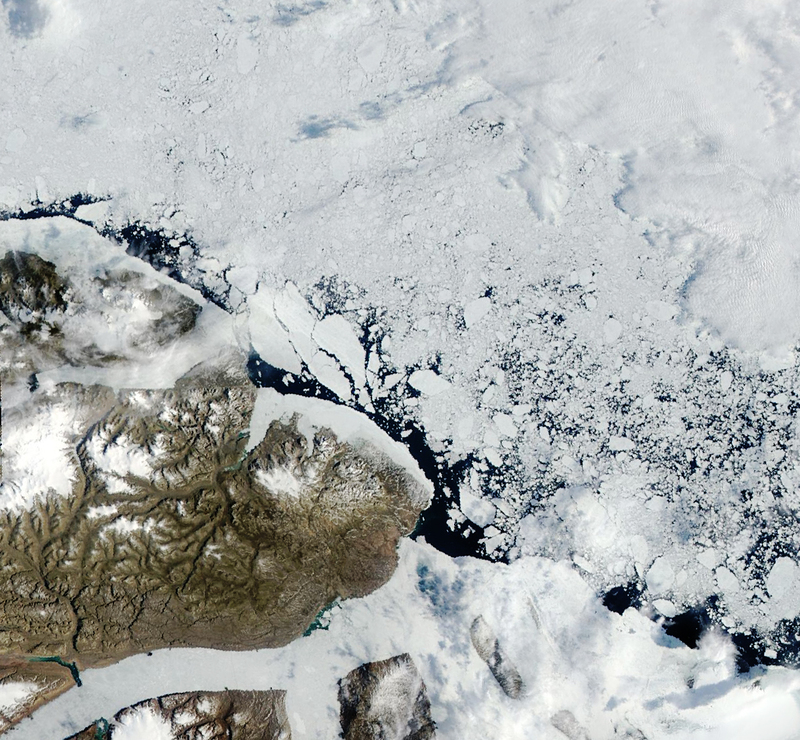 This ice cap is the largest in Greenland, measuring about 8,500 square kilometers, although that’s still much smaller than the 1.7 million square kilometer Greenland Ice Sheet that spans most of the country. Studies show that some parts of Flade Isblink are gaining mass while other parts are losing mass. 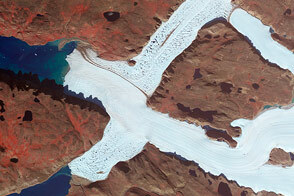 Meltwater from the surface of the ice appears to be causing its glaciers to surge, or speed up. In late summer 2015, a mitten-shaped feature appeared on the surface of Flade Isblink. Scientists determined that the depression was caused by the release of water from a lake below the ice, which had become overfilled by meltwater draining from the ice surface. This animation, composed of MODIS images from the Terra and Aqua satellites from July 27 to August 1, 2018 (excluding July 28 due to cloud cover), shows the motion of the region’s sea ice, which is a bit more brisk than glacier movements. Some of the waters in the fjord systems of northern Greenland are covered with sea ice year-round. “Multiyear ice” in the area can survive several melt seasons and become fairly thick. 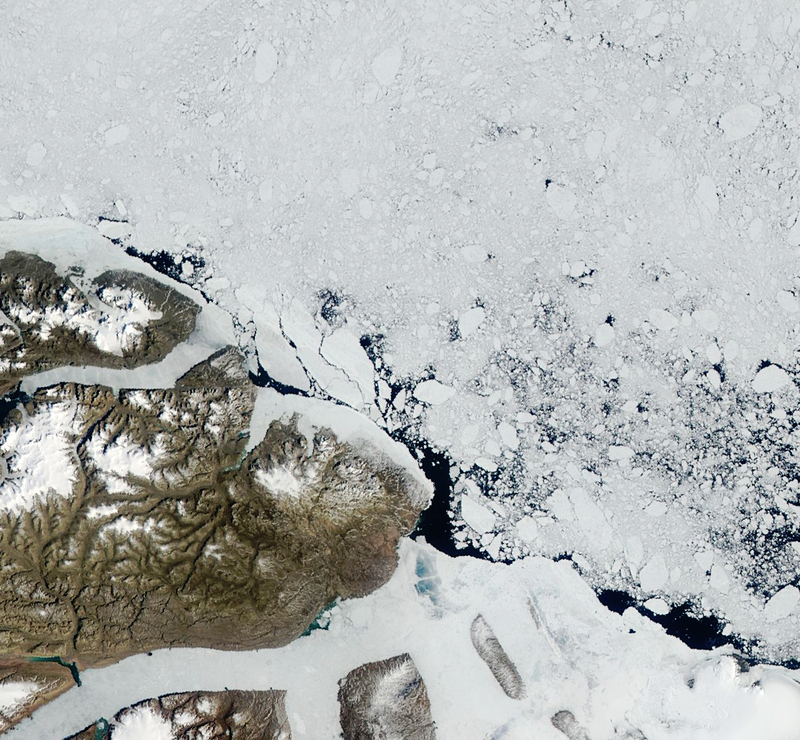 That includes the region’s fast ice—a type of sea ice that clings to the shore—which can last for years at a time. But as the animation shows, there are also areas of seasonal ice cover that can melt and break up during the summer months. Fjords wind between icy, rocky islands and peninsulas, and connect inland areas to an ice-choked ocean. Hill, E.A. et al. (2018) Dynamic changes in outlet glaciers in northern Greenland from 1948 to 2015. The Cryosphere Discuss., in review, 2018. Hill, E.A. et al. (2017) A Review of Recent Changes in Major Marine-Terminating Outlet Glaciers in Northern Greenland. Front. Earth Sci., 4(111). 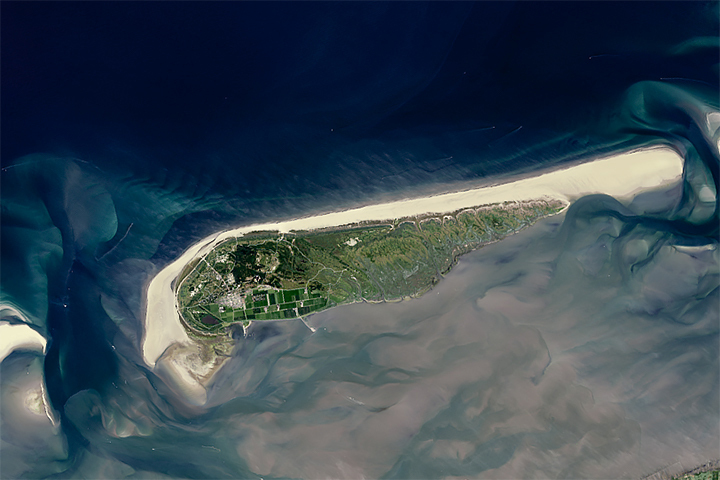 Nørgaard-Pedersen, N. et al. (2016) Investigations of past climate and sea-ice variability in the fjord area by Station Nord, eastern North Greenland. Geological Survey of Denmark and Greenland Bulletin, 35, 67–79. Rinne, E.J. et al. (2011) On the recent elevation changes at the Flade Isblink Ice Cap, northern Greenland. JGR Earth Surface, 116(F3). Willis, M.J. et al. (2015) Recharge of a subglacial lake by surface meltwater in northeast Greenland. Nature, 518, 223–227.